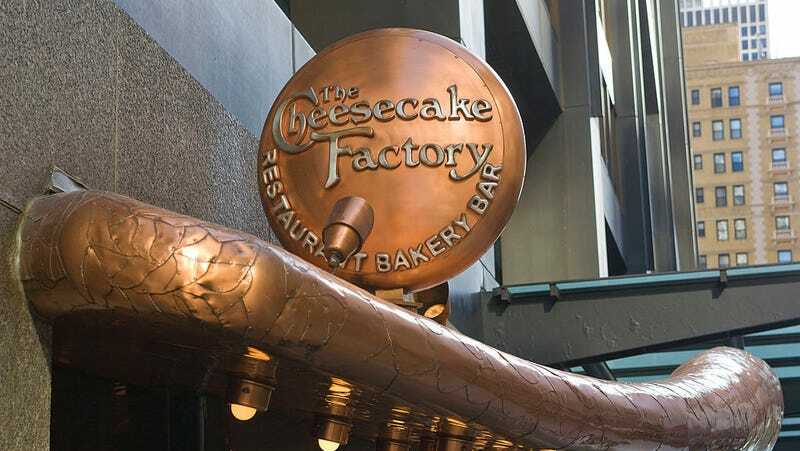 In an interview with Eater, the Cheesecake Factory designer Rich McCormack explains how the restaurant’s signature look came together. The inspiration was apparently inspired by the time restaurant founder David Overton spent in San Francisco in the 1970s, which led to the company experimenting with many eclectic styles. Just like how founder Overton wanted to appeal to the “palette of the common man” with the Cheesecake Factory’s food, McCormack says when it came to designing the spaces they never wanted to do anything too trendy that would need to be replaced in a few years. And this is why the restaurant’s opulent aesthetic feels special in a time of dying malls and constant rebranding for fast-food and chain restaurants. Places like McDonalds, KFC, and Taco Bell are rebranding to look less like plastic toys to and more like sleek, modern cafes. There’s something a little horrifying about TGI Fridays ditching the cluttered walls in favor of some bland, Kinfolk magazine-approved design. Thankfully, whenever you step into a Cheesecake Factory, you’ll know it will always be tacky.